Decisions, decisions. 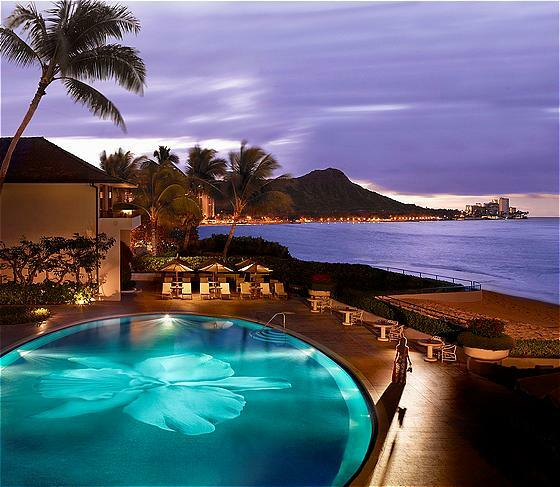 Do you stare beneath the water at the Cattleya Orchid made of millions of mosaic tiles, that span the bottom of the pool or out to the stunning views across Diamond Head? Its a pinnacle pool experience either way. So here are the statistics. The massive heated pool is 46 by 82 feet (13 plus metres by nearly 25 metres), certainly worthy of mega-pool status. The flower is made up of 1.2 million individual pieces of shimmering glass mosaic tiles imported from South Africa and blossoms out to 30 square feet (over 9 square metres). OK, so if we've decided size does matter what The Luxury Travel Bible really likes are the hotel's vast premier suites; the Vera Wang, the Royal and the Orchid. Looking down at the flower power.